The ArtsEd Forever! 2017 Gala – which annually honors outstanding contributions to arts education in Broward County – recognizes, teachers, legislators, local businesses and community leaders. There was a buzz of excitement in the air as well-heeled guests arrived at the Broward Center for the Performing Arts last Wednesday night. No, it wasn’t for the opening of a touring Broadway show, but for an event celebrating the leaders who shine a light for the talented youth in our community. Honor of Excellence awards are presented in five categories to teachers of: dance, music, theater, visual arts and teaching artists. There is also an award for Outstanding Contribution to Arts Education by an individual and an organization. These two awards recognize both local individuals and businesses or organizations that enrich our community through funding, volunteer hours, advocacy and creating arts programing that help to advance arts education in Broward County. This special evening started with a private reception for award nominees and sponsors, as well as a public reception for supporters, parents and families, followed by the award presentation and a showcase of performances by students from Broward County schools. Kobie Alleyne from Nova High School greeted guests with his melodic steel drums as they entered the lobby, and ____ year old Brandon Goldberg gave a spectacular piano performance at the private reception, mesmerizing honorees and guests alike. Other standouts included two delightful and well choreographed dance pieces from Falcon Cove Middle School Dance presented by Andrea Alter, last year’s recipient of the Honor of Excellence for Dance; contrasting monologues performed by Emma Seeger from _________ High School; a short film by Joas Thermidor; and a vocal ensemble by Broward Spotlights. Ending the evening in a lively mood was a hip hop performance by K2 and Pablo Malco of Developing Dreams Foundation. Though we often hear that arts education fosters confidence, creative problem solving, collaboration and communication, it is inspiring to see the impact for yourself – encore! As a dancer, teacher, choreographer, singer and actress, she has been involved in the entrainment industry for over 25 years. Beginning her dance training at the age 4, Enjoli Paul, is a graduate of the renowned, New World School of Arts High School and toured the United States, performing with the Visa Corporation. She later attended FIU as a dance major. He is the Director of Bands and Fine Arts Department Chair and has received many honors, including, Conductor of the Florida All-State High School Honor Band, National Association Citation of Excellence and the Oliver Hobbs Award, in recognition of superior band performances and service in the field of music education. He was the first Hispanic to be selected “Broward Teacher of the Year” in 1999. Josue also was the Chair of the Special Learners Committee, Music Director of Broward Center for the Performing Arts Music and Theater Camp, and served on the Steering Task Force Committee for the Fine Arts Assessment Project sponsored by the Florida Department of Education. A graduate of FIU, he received the Award of Distinction after leading his ensembles to Grand Championship title at the Fiesta-Val Music Festival in Atlanta, “Fan Favorite” after his Marching Ensemble obtained the highest marks, a nomination for Broward Arts Teacher of the Year at Avant Garde Academy of Broward and Grammy National Educator. Mr. Rodriguez is also an active member of the US Air Force – Civil Air Patrol. He is an accomplished playwright/screenwriter, actor, acting coach director and instructor. Mr. Aris has received recognition from the Miami Dade Weed and Seed for writing and directing a non-violence play for the City of Miami. He also received recognition from the State of Florida Energy Conservation Department for directing a play for the state as part of an energy conservation initiative. She has won awards for acting, directing, playwriting and costume design and appeared on stage with many of South Florida’s most prestigious theater and opera companies. Ms. Garrard made her New York debut at Carnegie Hall and has appeared in the World Premiere of Let There Be Balloons, as well as, as Madame Thernardier in, Les Miserables at PPTOPA. She directed students of a Title 1 public performing arts elementary school in their first Broadway Jr. musical and those same students won “Judges Choice” at an Anti-Bullying Commercial contest for high school media classes. She was twice elected as the VP of Professional Development for the Urban League’s Young Professionals Network in Broward County. He has been instrumental in obtaining top awards for his students for art competitions, scholarships and exhibits. Mr. Dixon and his students have participated in community events and socially conscious projects throughout the community. She has taught art to students of Broward County for almost 25 years and plans to acquire a Masters Degree in Art Therapy. As the National Art Honor Society sponsor, she has over 45 members who participate in philanthropic activities across Plantation. 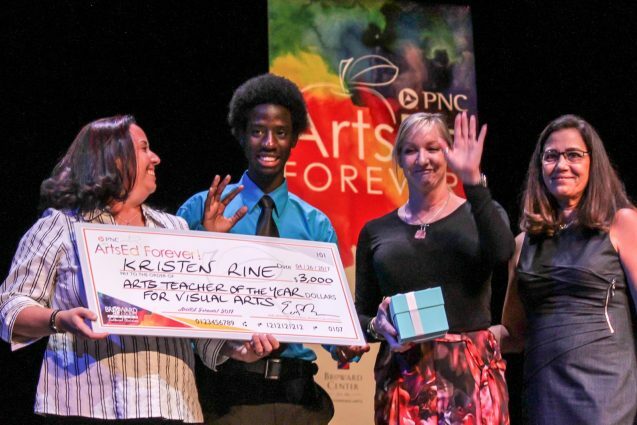 Ms. Rine teaches, Advanced Placement Studio Art Plantation and International Baccalaureate Visual Arts classes. She has also started a Creative Arts class for special needs students and is a sponsor of programs, which work with district wide events and workshops concerning mental health issue. Myrna Meeroff is the founder and Executive Director of the South Florida Chamber Ensemble and teaching artist for the VSA Florida, which provides arts services to the disabled population, as well as, a member of the Arts in Education Directory for Broward County. She has performed all over the world as a horn soloist and has appeared on several recordings including the Latin Grammy award-winning album Danzon by Six. Jim Hammond is a producer, designer and community arts leader. He has worked with New World Symphony, Florida Philharmonic Orchestra, and Florida Grand Opera to name a few. Mr. Hammond, was a Puppet Master of the National Broadway Tour of “The Lion King”, and is currently the Founder/Executive Producer of Florida Day of the Dead Celebration. He has also expanded his studio with the opening of Puppet Network, for live entertainment and is a recipient of he Knight Foundation Arts Challenge Award. Jim Hammond’s company, Puppet Network, specializes in festivals, theatrical productions and web/mobile content. He has taught hundreds of workshops nationwide on theater and puppetry. His educational program, TEEN ARTrepreneurs helps Broward County teens to start their own theater companies and his Day of the Dead Festival was name in the top ten in North America by USA TODAY. Housing Authority of the City of Ft. Lauderdale has been committed to providing safe, decent and affordable housing to low-income residents in Broward County since 1938. Broward Cultural Division partners with the HACFL to implement the Sistrunk Artists In Residence Program, which provides residents of the community with access to art and cultural programs.